This Cork Board is a Tamper-Proof Wall Directory! 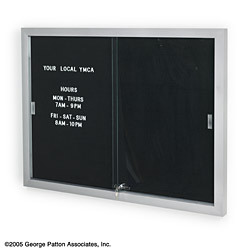 This Cork Board is a Letter Board With Locking Glass Doors! 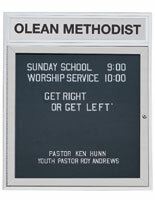 See a Wide Selection Online at CorkBoards2Go.com! 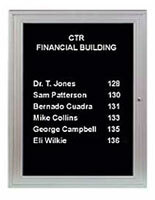 This cork board directory is framed in appealing satin silver aluminum. Total dimensions are 36" tall x 48" wide. That gives you merely under 10 feet of lettering location! 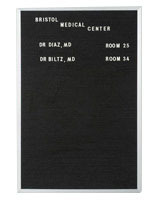 Precision-grooved cork board directory accepts all injection-molded letter sets, and is faced with black felt. 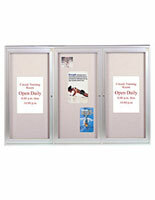 Provided with our cork board directory is a box consisting of 180 letters and numbers 1" tall. Varying sized sets are accessible separately. Two 1/4" thick tempered safety glass doors with finger pulls slide on nylon roller tracks. 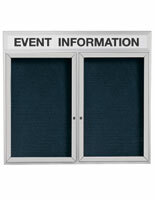 The cork board directory is also tamper-proof with the inclusion of a showcase lock. Masked mounting brackets are provided. 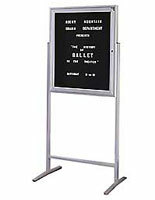 Buy our sharp-seeking cork board directory for your school or office! Interior depth is 2 1/4".